The above article is featured in the latest issue of Empire (June 2011) which is out now priced at £3.99. David Tennant plays Joe, father of ten year old Tom and teenage Lucy. He's no longer married to Mimi (Sarah Alexander.) She's on marriage 3 now but both parents try hard to keep the ties that, naturally, will bind them all at least until the two children have finished school. So there's lots of driving around, talking on mobile phones, picking up and bringing back, trying not to contradict each other. But it's all very wearing so Joe has a bright idea. Is is practical? This comedy by Marcella Evaristi shows every sign of being neatly drawn from life. We're introducing a bit of a new feature to the blog section of the site with guest bloggers getting the chance to write an article. It’s fair to say that, if I were hunting around for a subject for a musical, the life of Czech writer Franz Kafka, author of the disturbing ‘Metamorphosis’, probably wouldn’t be at the top of my list. Hopelessness, alienation and death at the age of 40 from TB don’t exactly fit with the glitz and glamourof musicals, after all. But that didn’t put off writer (and Dr Who composer) Murray Gold, who hassucceeded in creating an entertaining and touching – if somewhat confusing – drama from this most unlikelysubject matter. ‘Kafka: The Musical’ begins with Kafka (played by DT) waking up from uneasy dreams one morning to find, not that he has been transformed into a gigantic insect, but that his life has been turned into a musical.His father, keen to see Kafka do some real work andfinally earn a living, has convinced local showbiz producer Herr Grossman to work with Kafka on a new show. BBC Four are to repeat all six episodes of Twenty Twelve, a mockumentary about the team organising the London Olympics, which featured David's vocal talents as the narrator on 8th May from 12:20am. If you missed David in Kafka The Musical on Radio 3 last night you can download an MP3 file here. A lavish new BBC drama about the aftermath of Manchester United's tragic Munich air disaster was seen by 3.2m on Sunday evening, the latest audience data has revealed. United, starring Jack O'Connell, David Tennant and Dougray Scott, averaged 2.89m (12.8%) for BBC Two between 9pm and 10.30pm, while 346k (1.5%) tuned in on the BBC HD channel. Channel 4's The Hotel, a new docusoap from the makers of One Born Every Minute, continued with 1.39m (6.1%) in the 8pm hour, down 650k on the previous week's debut episode. A further 219k (1.9%) watched the show on +1.On BBC One, Britain's Royal Weddings, a two-part mini-series presented by Sophie Raworth, concluded with 3.45m (14.6%) in the 9pm hour. It was preceded on the channel by Antiques Roadshow, which had 4.74m (20.7%). We've added some screen caps from United to the gallery here. You can download them all as one file, share them on facebook etc all directly from the gallery. 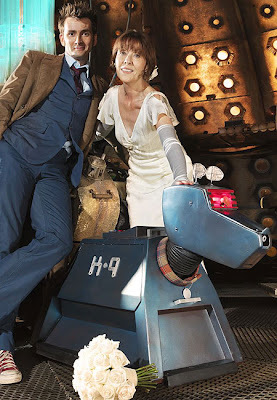 CBBC will be showing David's episode of The Sarah Jane Adventures as part of it's 'Royal Wedding Day' special. It will air on Friday 29th April at 9am and on Monday 2nd May at 11:20am. You can also catch up with Lis' return to Doctor Who in School Reunion which Watch will be airing tomorrow at 12:55pm. 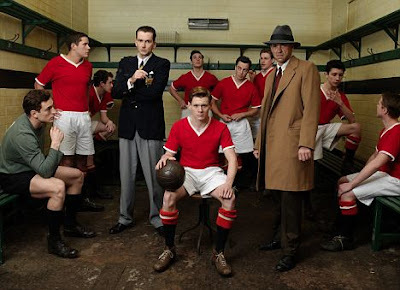 Barney Ronay visits the set of United, a BBC film telling the true story of Manchester United and the 1958 Munich air disaster in which 23 people died. Stars David Tennant, Dougray Scott and director James Strong talk about bringing one the most famous British football stories to the screen. Dramas about sport are often disappointing affairs: lacking in proper detail, hammily acted, and with a deathly predictable narrative arc in which a troubled team overcomes the odds to win the cup/medal/race in a shower of ticker tape glory. Once in a while, though, a real contender comes along which manages to leave the clichés behind and capture the essence of a sport – hard graft, beauty, tragedy and all. United, written by Chris Chibnall, is just such a film. David's new drama United airs on BBC Two tonight at 9pm, below are some articles from the recent TV listings magazines. Kafka The Musical will air on BBC Radio 3 tonight from 8:00pm. David and Catherine appeared on The Graham Norton Show on 15th April 2011 to chat about their new play Much Ado About Nothing. United airs tonight on BBC Two at 9pm. David will be starring in a brand new show, The Gobetweenies, on Radio 4 from next month. 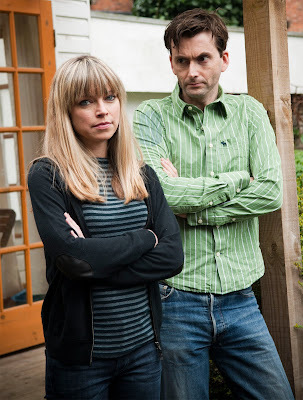 David Tennant and Sarah Alexander star as multi-married exes in a shared parenting comedy, written by Marcella Evaristi and directed by Marilyn Imrie. The Gobetweenies is a candid look at contemporary family through the prism of two North London siblings, Lucy and Tom, as they schlep between their determinedly hands-on parents. Joe can't take being a "once a fortnight" dad. Lucy is excited about exploring surrealism, Tom is obsessively counting sultanas and their mum, Mimi, is desperate for her third attempt at married life to get started. But the children's father, Joe, has come to a decision that will change all their lives. David Tennant plays Joe, Sarah Alexander plays Mimi, Finlay Christie plays Tom, Phoebe Abbott plays Lucy and Stuart Milligan plays Harry. Apologies for the recent lack of updates. Unfortunately due to very sad personal reasons Sarah has been unable to work on the site and so I have decided to take over the helm until she is ready to return to the site. I'm sure you'll all join me in wishing her all the best and I really hope she's back soon as it's not the same without her! As you can see we have a bit of a new look. I hope you all like it. It's 6 years since we started out and as DT turned 40 this month too we thought it warranted a spring clean! 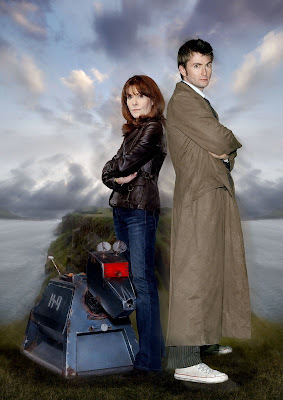 As you will no doubt have heard Elisabeth Sladen very sadly passed away on Tuesday morning. The BBC have announced that they will be showing a tribute to her on Saturday 23rd April at 6.45pm on CBBC. "Elisabeth Sladen created one of Doctor Who's best loved and most enduring characters, Sarah Jane Smith. For over 35 years she brought the feisty, compassionate journalist to life, creating a figure that was adored by audiences of all ages - truly a heroine whose appeal had no boundaries.